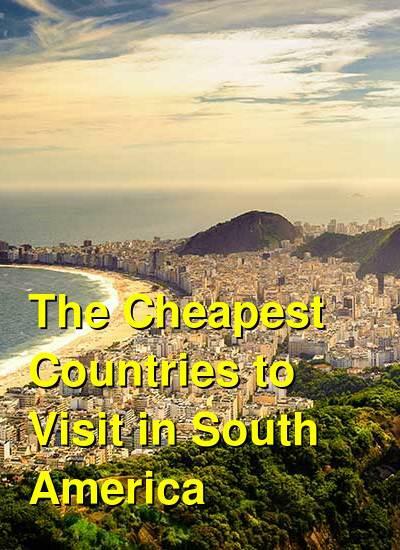 What are the cheapest and most expensive countries to visit in South America? The following travel cost rankings for countries in South America are calculated based on the travel budgets of real travelers. Also referred to as a Travel Cost Index, or a Backpacker Index, the countries below are in order from most to least expensive by their average daily travel price, per person, per day. What are the cheapest countries to visit in South America? The least expensive countries for travel in South America are currently Bolivia ($27.47), Colombia ($29.75), Ecuador ($42.31), and Peru ($46.20). What are the most expensive countries to visit in South America? The most expensive countries for travel in South America are currently Chile ($109.89), Uruguay ($74.70), Brazil ($74.29), and Argentina ($63.01). Steeped in history, South American cities have unique charm, beauty, and elegance, and are simply begging to be explored. For the more adventurous who like to wander off the beaten path, countless exciting adventures and excursions await. There are activities for all ages and activity levels including hiking, rafting, zip-lining, learning to surf, cook or speak Spanish, cruises and walking tours, just to name a few. The climate in South America can vary quite greatly from region to region, but tropical temperatures can be found nearly all over the continent. Whether you're looking for sun and tropical birds, or glacier hiking, South America has it all and everything in between! It is rich in diverse and deep-rooted cultures stemming from hundreds of years of history and tradition. Whether it comes to food, culture, tradition and heritage or even climate and geography, every country is as different as it is similar to its neighbours and worth exploring in their own right. Colonial and native history have intermingled and produced some of the most vibrant cultural landscapes in the world. From the Argentine Gaucho to the Andean Shaman, you're sure to experience full cultural immersion anywhere you visit in South America. Hotels and restaurants are more than accommodating, and there's nothing quite like South American cuisine. With influences from indigenous populations, nations in Africa, Spain, Germany, and Italy, you will find yourself feasting on rich, flavorful dishes, and luscious tropical fruits. You'll be accompanying your meals with wines from some of the top vineyards in the world and other beverages unique to these countries. South America is an amazing continent to travel on a budget, though you would be wrong to assume that every country in South America is cheap! The least expensive countries are Peru, Ecuador, Bolivia and Colombia, each attracting large numbers of budget travellers. Countries like Brazil, Chile, Uruguay and Argentina are relatively more expensive, sometimes approaching Western prices. If you're travelling across South America, a good rule to keep in mind is that you will probably need about USD$1000 a month, though this depends greatly on which countries you'll spend most of your time. Of course not everyone will sleep in dorm beds as well. If you decide to stay in a basic private room in a hostel, guesthouse, or small independent hotel, you will probably need to double that value. One of the priciest location in Colombia is the beautiful and historic colonial city of Cartagena, as it is the most touristy place in the country. Beyond this, cities like Bogota, Medellin and especially the countryside are very affordable. Ecuador has a fairly low cost of living. It is astonishingly diverse and interesting but it's also a relatively small and compact country, which reduces the need to spend on long-distance transportation the way you will in neighbouring countries. Peru can be very affordable with a lot of great value accommodation and food in the amazing places that every backpacker wants to visit. However do not be surprised that your visit to the Machu Picchu and the Lake Titicaca will be your biggest expenses. Bolivia tends to offer the lowest prices for accommodation and the cheapest options for food and drink as well. In Argentina, the country can be expensive or inexpensive depending on how and when you change your money. Buenos Aires is quite expensive whereas outer cities like Salta and Mendoza are cheaper. Distances in Argentina and Chile are huge and long bus rides are not uncommon, so be sure to factor bus travel into your budget. If you are on a tight budget, consider cooking your own food rather than eating out in Chile. One place where you will find it impossible to travel on a tiny budget is the Easter Island. From the dirt poor favelas to the high-rise offices of Rio, Brazil is definitely a country of contrasts and has one of the highest levels of social inequality anywhere on the planet. However, prices in Brazil are close to Western prices for travellers so you should budget accordingly.